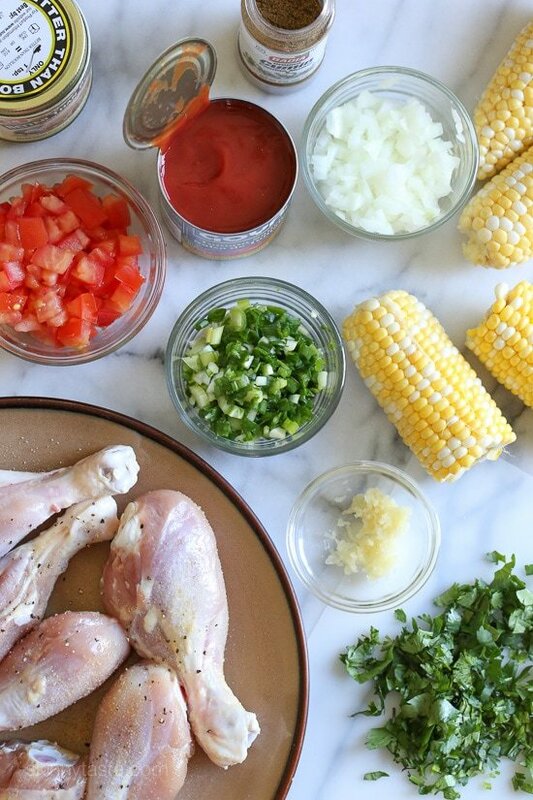 Chicken stew with corn (pollo guisado) is one of my favorite comfort foods, and my whole family loves it. I made this three times the past two weeks, that’s how good this was! 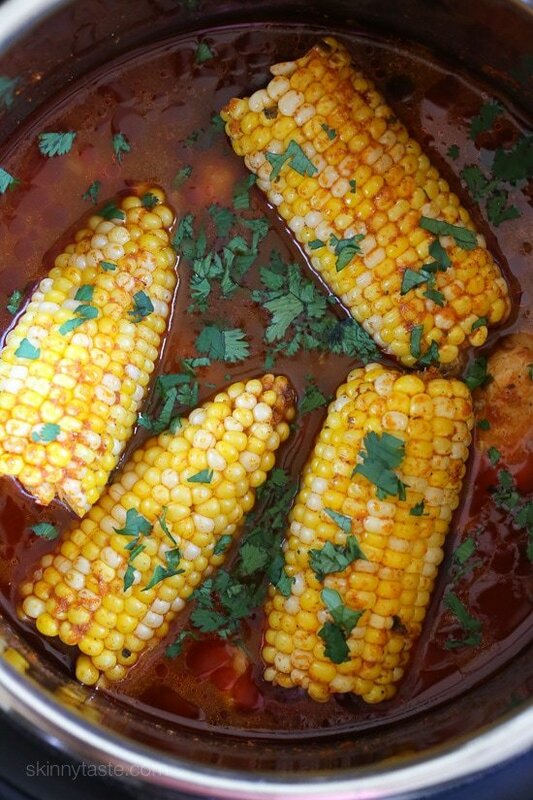 I wanted to take advantage of fresh summer corn in season and this turned out wonderful! I also have a similar version with beef, Carne Guisada. Other stews I love are Jamaican Coconut Shrimp Stew and Slow Cooker Pork and Gandules (Pigeon Peas) Stew. If you want to keep this Whole30 or Paleo, leave the corn out. I served it over rice for my family and over cauliflower rice (Trader Joe’s now carries it!) for myself. I just love using drumsticks, but you can use whatever you want as long as it’s on the bone which adds flavor. I usually make this on the stove in a big pot and let it simmer on low 35 to 40 minutes until tender. With my Instant Pot (slow cooker, electric pressure cooker, rice cooker, steamer, yogurt maker in one) sitting on my counter, I decided to use that instead and the results were perfection in half the time. The chicken literally falls off the bone and the flavors all work so well together! If you don’t have a pressure cooker, the stove is perfectly fine! To freeze any leftovers, transfer to an air-tight freezer safe container and store in the freezer for up to 3 months. To reheat thaw overnight in the refrigerator and heat on the stove, pressure cooker or microwave. Chicken stew with corn (pollo guisado) is one of my favorite comfort foods, and my whole family loves it. I made this three times the past two weeks, that’s how good this was! Season chicken with salt and garlic powder. 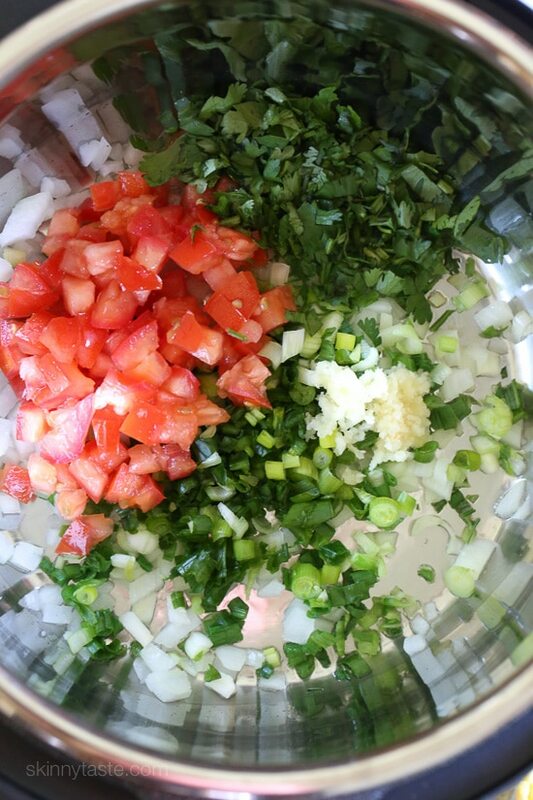 Saute the onions, scallions, tomato and garlic in olive oil until soft, 2 to 3 minutes. Add 1/4 cup cilantro and stir 1 minute. Add tomato sauce, water, Bouillon, cumin and stir. Place the chicken in the sauce. Top with corn, cover and cook on high pressure 20 minutes. Natural release and top with remaining cilantro. To make on the stove, simmer low covered 40 minutes adding the corn the last 5 minutes. I keep reading comments that its too watery at the end but pollo guisado is a stew. It should be watery like soup. You serve it with rice and either dunk your rice into the soup or pour it over and allow it to absorb into the rice. Many Latin American recipes are served with liquid like that. It’s also sopped up with tortillas. I’ve probably made this recipe 50 times! My all time fave IP dish. 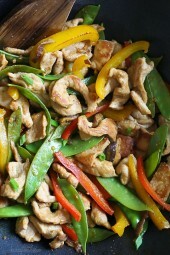 Super easy and FULL of flavor! I’m new to the instant pot world and this is what I’ve decided to make first. 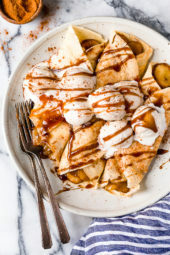 Is it possible for you to make a video for this recipe? I only have frozen corn on the cob. Help! Will this later the cooktime? Add another minute, it should be fine! I am a twenty-something with a somewhat crazy work schedule and this is one of my go to dinners for hectic days! It’s so easy and the flavors are amazing! Plus I could eat leftovers for days (and I am not a leftover fan.) Definitely ranks in my top 10 recipes of all time. Love love love! What are you serving this meal over? I cannot make out what it might be? I think it’s cauliflower rice ? Gina! This was wonderful. So tasty, easy, and fast in the IP. How does your family eat the corn? Do you eat it off the cobb on the side or do you cut the kernels off and add back to the dish? We love it all ways! Hi Gena, I’m new to pressure cooking and to Skinnytaste. I made this tonight and while the flavor was wonderful and the chicken was very tender, the sauce was very thin. Is it supposed to be thin? I was wondering if I could add a can of diced tomatoes and take out one cup of water. Do you think this would work? Delicious! I served it with cauliflower rice but my calculations for WWfreestyle comes up to 9 points, not 4? Absolutely love this dish. Have made it 8 times using varies pieces of chicken. All other ingredients are exactly as written. We prefer white meat so our favorite piece of chicken is wing drumettes. I like this recipe, but it is NOT fast. It’s nowhere near 30 minutes. It probably takes me 10 minutes to prep the chicken, cut up all the veggies and saute them for 2-3 minutes before adding everything else and setting the pressure pot on. Then it takes… I don’t know… 20min or so for the Instant Pot to come to pressure, THEN the 20 minute presser timer starts. And for natural release, after 50 minutes, I got really tired and hungry of waiting for natural release to happen so I ended up finishing with a quick release. So for me, this recipe takes more like 2h. It seems like it would be way faster if I would just make it on the stove. Am I missing something?? Can I double the recipe if I have an 8qt instapot and use the same cook times? One of my favorites, so easy to make and picky toddler approved! How much for one serving? I love your recipes and I’m struggling to figure out how much to enjoy in one sitting and how much to leave for the next day’s meal. The serving size is at the bottom of each recipe. I have made this dish several times and shared with friends. It is absolutely delicious!!! Hi! I put this in the recipe builder and got 8 points, not 4 points. I was wondering how you were able to get 4. Thanks! I use the weight of the drumsticks, they vary in size and weight. 15 points no skin, 1 point bouillon, 1 point oil. One clove or toe or the whole head of garlic? Looking for something different to use my instant pot for and this recipe was awesome. Made a couple of changes because I were too lazy to go to the store so I used can diced tomatoes instead of plum tomatoes. Also added more corn I love corn. My only knock on the recipe is i think the chicken should be browned to avoid the white chicken look which my daughter hates. I will be making it again tonight. This was very very tasty! It’s definitely going to the “frequent meals” bucket!! Thank you! 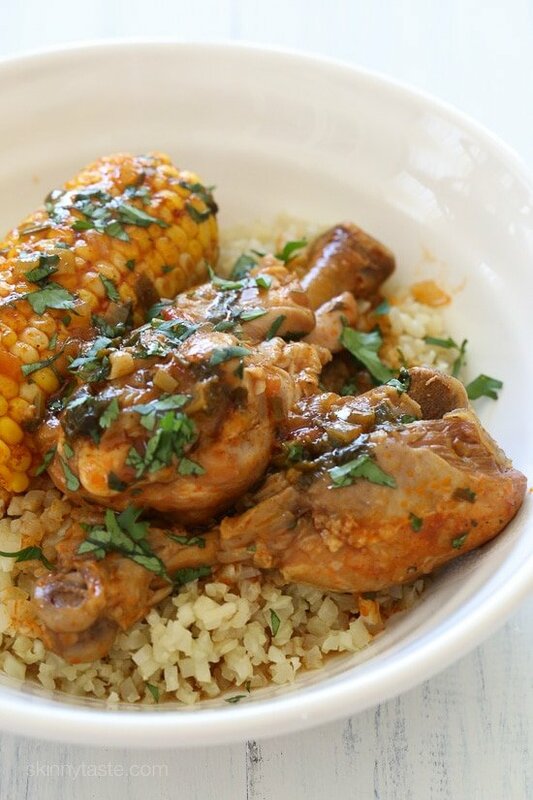 My husband hates drumsticks, and even he loved this recipe! It was soo flavorful! Thank you Gina! Made the stove top method and the taste was over the top!!! Now I am on the hunt for an Instapot-can’t wait to make it again! I can’t wait to try this…I’m fairly new to Skimnytaste and absolutely have loved every recipe. I have tried!! I even have my husband eating healthy even though he doesn’t know it. If I make this in the crockpot should I wait to add the corn or can I dump it all in the beginning? Can this be made with the rice added to the IP at the beginning? I am due in 4 weeks and am trying to find some make ahead meals so hubby and I can focus on baby instead of stressing over food when we come home from the hospital. Curious if you think this can be prepped in advanced and put into the freezer a week or 2 before cooking. Do recipes change quantitys if you have a smaller instant pot? I only have the 3 quart. You can halve the recipe if you wish. I don’t use products like better than bouillon. Do you have a recommendation for a whole food/s substitute? Thanks! Just made this tonight. It was relatively fast to assemble, easy to make and delicious. My kids thanked me more than once for the great dinner. I doubled everything (except the chicken but it was close to double) as I have a large family and also like to have a leftover serving for myself for lunch on another day. I served it with some long grain rice I’d seasoned a little with some bullion, rotel and garlic. It was a hit. I used a 1/2 c. of cooked rice for my serving and it was perfect. I also used frozen corn on the cob as corn is not in season and it was still delicious. 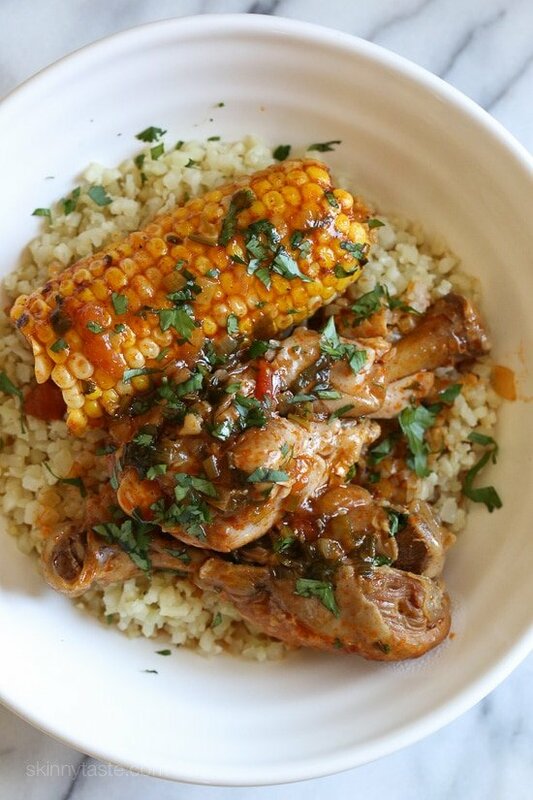 It reminds me of your chicken sofrito stew which I first tried probably a decade ago and still love! thank you a favorite of mine as well! I must be doing something wrong. My chicken was completely bland. The sauce itself had a good flavor but it was thin. Just sunk to the bottom of the rice i served with it. I poured it over the chicken and it didn’t stick so it didn’t exactly flavor it. What am I doing wrong?? This is definitely one of my family’s favorite of Gina’s recipes. I’ve made it in the Instant Pot many times. A couple of times I’ve used the leftover sauce/broth for soup and it’s delicious. I’ve also made it on the stove top while I cooked the rice in the IP and it’s just as good. Gina knows how to please my tummy! BTW, I wish I could save my favorite recipes on this site. Want to make friends and win people over? Make this dish. This is my go-to recipe for quick meals in social settings, including at remote cabins in the woods. My friends always LOVE it and never leave me any leftovers. So stinkin’ easy to make with boat loads of flavor!I serve with rice and/or cauliflower rice, depending on who’s eating; then some avocado chunks, lime to squeeze, and cilantro. Also – I’ve made it with several different chicken combos, i.e. breast, thigh, on bone, off bone, etc. All turned out phenomenal. This is so yummy! And it smells amazing when cooking. I love the pressure cooker recipes. I am still old school with a rattle top pressure cooker….. still thinking about an instant pot. But this comes together so fast and is so flavorful. Questions about the weight watchers point. I am trying again and have started on the new plan. I use the app all of the time to track my food choices and love it. 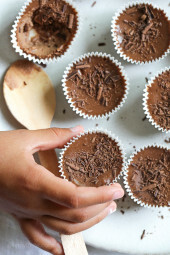 When I put in the nutritional info from this recipe (I used what you have listed) I get 6 points for a serving, not 4. No biggie…. just wondered if you knew why? I am currently cooking this and it smells wonderful btw!!! I punched it in and got 4 pts. I think you have to base it on the weight, not count. It was more points when I entered it as8 drumsticks, so WW May be thinking bigger drumsticks than were used in this recipe. This was delish. Didn’t have scallions so subbed onions. My question is points. Drumsticks w bone are 4 pts each in Ww calculator. You are calling it 4 SP for two? Did you use the recipe builder? This the first recipe I tried in my Instant Pot! Turned out SO GOOD! The flavors are amazing and the meat just falls off the bone. My boyfriend was literally licking his plate! This one is a keeper. You can saute right in the pot! I recently bought a 6 quart instant pot. It quickly became my favorite kitchen gadget and I recently bought an 8-quart instant pot so I can cook enough for leftovers. Does the cooking time change between using the larger or smaller pot? Gina which instant pot size to you generally use? Can I make this in my crockpot – 8 hours on low? Would frozen corn-on-the-cob work instead of fresh, and if so, should I thaw it first? I was thinking the same thing. Corn on the cob is not found in the north during the winter 🙁 But I also don’t like frozen cobs, they always seem mushy. Maybe just frozen kernels? I made this dish tonight — too late in the season for fresh corn on the cob. I added 1.5 cups of frozen corn kernels for the last 5 minutes of cooking and it came out beautifully. I didn’t bother to defrost the corn, but i did raise the heat somewhat to compensate for adding ice-cold corn to the simmering stew. According to my googling, there is approximately 3/4 cup kernels in an ear of fresh corn. I should have specified that I made this on the stove, not in a pressure cooker. Can I make in an instant pot using the same directions? A new chef here, why the boullion cube? ….what do you advise, ok to switch to two cups chicken broth—instead of two cups water and boullion cube? I’m sensitive to msg products–and would LOVE to give this stunning recipe a try this weekend, but only if the taste is still awesome. Thank you, Gina! 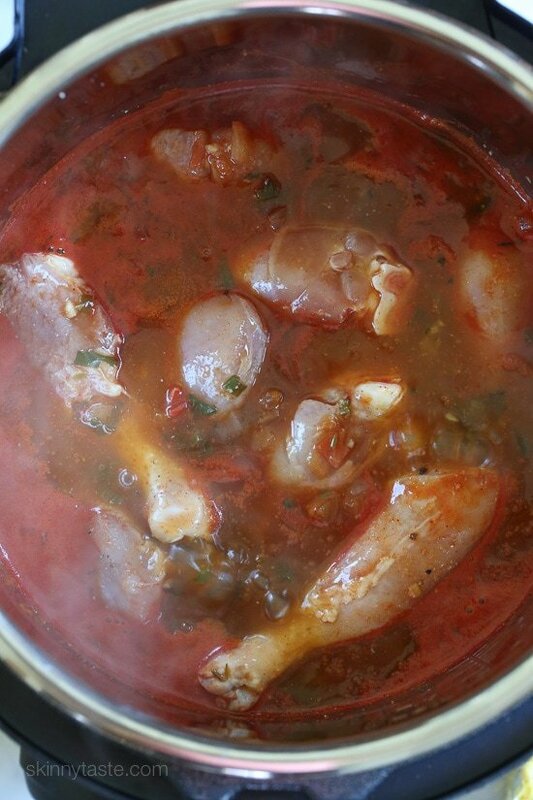 Would the cook time change if I used boneless skinless chicken thighs? Ommmmmergod. This dish is FANTASTIC. I think this is maybe the 6th or 7th recipe I have tried on Skinnytaste. I’ve enjoyed all of them, but this is a fav for sure. Followed the recipe exactly as directed for stove top. Came out perfect! Will be making again!. I would love to do this in the slow cooker. When should I add the corn? Thanks! This was delicious!!! We will definitely add it to our regular recipes!! We cooked it on the stovetop, and it came out great!! Gina, should I use natural release or quick release for this recipe? Thanks! This was a hit tonight with the husband. He did say he would probably like it with beans added also. I served it over rice and that worked nicely. It took me about an hour start to finish (chopping, coming up to temp, de-pressurizing). I hadn’t cooked corn on the cob in the instant pot before. It turned out great! I was worried it might be mushy, but it wasn’t at all. I will definitely make this one again! I made this tonight for my family exactly as posted. Everyone loved it, and it was so easy. Thank you so much!! Also made the Rock Creek beans last night and again, love! Even better today for lunch. Any tips if I wanted to use boneless skinless chicken breasts? Do you leave the skin on? The recipe calls for skinless. This was fantastic! I used the Instant Pot and the chicken was fall-off-the-bone tender. So flavorful and filling! Another WIN with the fam! The 7 year old told me I need to make this again! The flavors are great and it is so easy to make. Perfect for Wednesday nights before church! Thank you! You’re welcome! Love kid approval! Quick question – Natural Release or Quick Release? Can this be made with chicken breast? Yes! I’ve made it with just breast on the bone as well as a mix of thighs/breasts on the bone. Each time it was OUTSTANDING. Such a great, basic recipe. I don’t think I’ve ever commented on a recipe but this was DELICIOUS…and the house smelled soooo good! Didn’t have any cilantro and it still turned out good. Thanks for the recipe! Many of your recipes call for cilantro and for whatever reason, I cannot tolerate cilantro (it tastes like soap to me). I love the color and would love to substitute the cilantro in your recipes for another fresh herb, and am curious if you have any recommendation flavor-wise on a possible substitute? Thanks so much for your time! Hi Crys, I am not the original poster, but I may have some good info for you. If you want a good alternative, try ground coriander. It won’t give you the color, but it will give you a flavor profile that is similar to cilantro without the soapy taste. Coriander is the seed that cilantro grows from. Otherwise, to add color, you should try some flat leaf Italian parsley. I would use this sparingly until you note how it affects the flavor of the dish.